Apple has released their annual holiday TV advertisement for 2016, titled “Frankie’s Holiday”. In the commercial, Frankenstein (yes, Frankenstein the monster) wanders down from a European mountain cabin into a town square with a Christmas tree, where he proceeds to sing the 1950’s classic “(There’s No Place Like) Home for the Holidays” with the assistance of the initially started townspeople and the Voice Memos app on iPhone. The advertisement ends with the tagline “Open your heart to everyone” and an  Apple logo. Just in case you want to hear “Home for the Holidays” in full, here it is for your listening enjoyment. Another Apple ad is also running simultaneously, titled “Bulbs” and promoting the new MacBook Pro with Touch Bar. 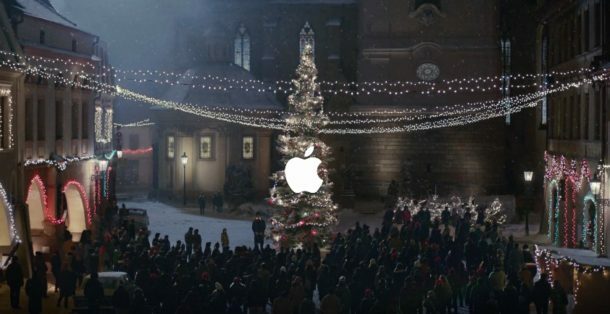 Great Holiday Halloween ad from Apple! Happy Halloween! Oh it’s Christmas? Frankenstein for Christmas? Oh I mean “Holidays”, Happy Holiday from Frankenstein?! Kind of like the “Pro” in MacBook Pro huh? No escape key, 16GB RAM, can’t change SSD, slower than 2015 model, an Emoji bar, LOL!!!! Ha hahahahah! Ha ha ha! Ha! Dell awaits you, so you can leave now. Always nice to such great holiday spirit from the dim bulb side of society. Name calling, db? It doesn’t put you in a good light. If you belittle and start name calling, it means you’ve lost the argument and have nothing to add. I have no idea who thought of this, but it is GREAT. Who would have thought to put the Frankenstein Monster in a Christmas commercial singing HOME FOR THE HOLIDAYS. Bravo to Apple and their ad agency. I too think it’s Brad Garrett, can anyone confirm? As for some of the comments Re: advert well it is what it is an advert, just take it for what it is. I think it’s lovely and it is Christmas and believe me there is a lot of lonely people out there!! It’s actor Jeff Daniels from Dumb and Dumber and The Newsroom. 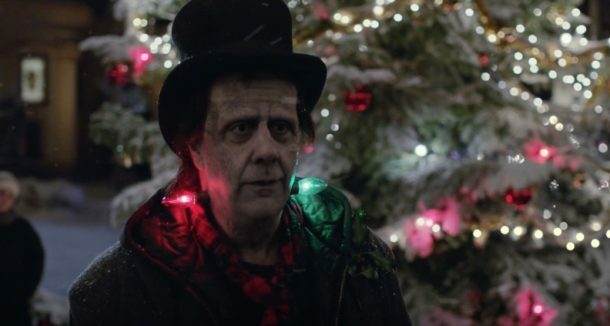 Apple has just released its 2016 Christmas ad, and it features Frankenstein’s monster. It’s an unusual — but arguably heart-warming — ad. The monster, played by Brad Garrett, decides to leave his solitary life behind. I think you meant to say “Frankenstein’s monster” instead of “Frankenstein the monster”. After all it was Dr. Frankenstein That created the monster! If you want to get picky, check the novel, there never was a DOCTOR Frankenstein. He never completed his college courses. He said the Frankenstein Monster, jerk. What are they advertising? All they sell is an overpriced/underpowered “pro” laptop, a phone that you can’t connect to that laptop, and a pricey book of hardware they used to produce. Just as a point of order, Frankenstein was not the monster, but the scientist who _created_ the monster. Glad to see I’m not the only one here with thoughts of “Frankenstein was the creator, dammit!” Mary Shelley’s novel of the same name is public domain now and easily available online, so if you haven’t yet read it, make that your holiday pastime. Hey, Is that Mary Shelley’s portrait on the wall? Nice. I couldn’t find a portrait of Mary Shelley that looked like that, but I thought it might be a portrait of the little girl in the book that wasn’t afraid of the monster. Correction, it is as you said, No Man, Mary Shelley. This a anti-Trump ad! LOVE TRUMPS HATE! Is that Jeff daniels playing Frankenstein….any guesses??? I believe it is Brad Garrett from “Everybody Loves Raymond” that’s my guess. I think Frankenstein in the Apple Christmas singer commercial is played by Arnold Shewarzeneger from “Terminator” but he has makeup on!! Sure was…..I loved them both on everybody loves raymond. Peter Boyle also was the Monster from Frankenstein. After 8 years of purposely instilling hatred and promoting disunity in the hearts and minds of half the population of the USA in order to “take back their country”, now that they have their genuine Frankenstein”s Monster in the White House, have total control of Congress and soon the Supreme Court – and now that they can begin their reign of terror, exclusion, racism, bigotry, jingoism. misogyny,and disinfranchisement without pity or regret —– now they want their victims to “open their hearts” to everyone – even the Monster they put in the White House. Well, my heart is in a panic room and can’t be opened and may never be agsin. But I would gladly open as many of THEIR hearts as I possibly could. Wide Open. That”s what I think of the ad. Merry money spending, suckers. It must be really hard to go through life being as bitter and filled with such hatred as you are. I feel very sorry for you. Thanks. But you should save your pity for your children and grandchildren, if you ever have any – their suffering will make ours pale in comparison. Well since we don’t murder our children through abortion, we will have pity on them and our grandchildren for the 20 Trillion in debt they will have to pay. They have this debt because of the narcissism of generations willing to borrow in order to buy votes with Obamaphones and public sector pension bailouts. That looks like….Brad Garrett! Does anyone know if it is? Yes, it is Brad Garrett, one of my favs. I have no comment on the products, politics, etc. I just really like the sentiment of this commercial. period. Oh for goodness sakes – This is a commercial… For years, commercials have been working to top eachother in touching people’s hearts. Regardless of what this commercial is advertising, the message is beautiful. Someone that recognizes it as “stupid”, only shows themselves as having no depth or to be quite shallow, “Frankly”… No pun intended! Lighten up, enjoy the season and look beyond ignorance to notice the warmth, and goodwill to men that this holiday brings! I hate this comercial. I change the channel every time it comes on. It is sad and horrible. Apple needs to get rid of it. No matter what they planned for it to mean, it is not sending a good message at all. I too just saw the add during the Lions Thanksgiving day game. Myself, I thought it was a well done and a heart warming commercial. lets everyone put aside our post election drama! Lets for two seconds pretend Frankie was real and just wanted to make friends. the tear in his eye when everyone started singing should be how we in real life treat each other. Open your hearts to Frankie, and everyone else… Happy holidays to everyone. The monster in the story did just want to make friends and couldn’t because everyone was afraid of him, except for one little girl who was blind. I really like the commercial, and poor Apple, I can never remember what it is for. This commercial made me want to barf. What a sappy load of garbage. I know its just an iPhone commercial, but I thought it was touching, giving a different person a chance to be part of something nice. Celebrating the holidays. Be kind people. The message is beautiful! With all the hate these days it’s refreshing to see something so positive! Great job Apple! This message was sent with my new iPhone 7plus that I’m extremely happy with! iPhone 7 is great until you need to use headphones or an AUX port for any stereo or car audio system, then it’s the worst phone you’ve had in a decade. Oh, do tell me about the dongles though, everyone loves carrying dongles. Yes, it was just an IPhone commercial. I thought it was a great commercial. I don’t know how anyone could think otherwise. Frankie opened his heart to everyone. The tear in Frankie’s eye at the end speaks volumes on how we should be treating each other. Happy holidays to everyone. I think it’s Hillary. She is not wearing a costume for the first time. I love this commercial for its wonderful, unapologetic wackiness. What’s wrong with that? Best ad on TV !!! God Bless!! You changed the significance of a dynamic commercial! When Frankenstein’s light went out, careing, love and understanding was shown when the young girl went up and turned the bulb! Put that back in! It will become a “Budweiser” special holiday moment from that moment on!!! Come on! OMG, I love the Apple Frankenstein ad featuring Frankenstein for Christmas, Is that Tom Brady? He is such a good actor!!! Does anyone know what he is carrying? Wow…..some of you are screwed up…. Wow….I didn’t think so many people were so messed up in their thought processes…..makes me sad……. Wow! Exa who hurt you? My job is placing people with significant disabilities in jobs that provide meaningful employment. Thanks, Phil. Hope you are a Christian. Any other religion means you better “get out of Dodge” soon. The threat letters were sent out by the new regime today. Better polish up your resume’, Freida, budget cuts to pay for those billionaire tax cuts and corporate welfare will assure you are out of a job soon. I guess Frankie’s tear didn’t help these folks. Would have catered to the nautical/aeronautical community if the bulbs on his neck had been switched. Red/left/port and green/right/starboard like ships/boats and airplanes. This is how you gain real knowledge… intelligent research, independent critical thinking and open mindedness. I find your lack of intelligence, understanding and hatred pathetic. Is that Brad Garrett (brother Rob from Everybody Loves Raymond)? Go smoke another bowl haters! I thought it was Brad Garrett!!! Love it! How can anyone not now that was brad garrett…his grunt & vocal gives it away plus who else good look that much like the monster with that little of make-up….plus all you franky fans the monster was givin the Frankenstein name in bride of…. I found it to be very touching, you could feel his loneliness, and pain.the warmth of the little girl making him feel wanted was beautiful. Too bad most can’t see it for it true meaning of showing kindness to everyone you meet. This is an awesome commercial..well done! Touched me. Apple didn’t by chance, hire the Budweiser commercial making crew, did they? It is Brad Garrett. If u read on Apple about commercial it says, “Frankenstein, played by Brad Garrett”. The actor in the Apple Frankenstein Christmas commercial is Brad Garret, some people said it was Jeff Daniels however, but it is not. Merry Christmas. Sorry that I thought it was Scrooge or Marley (sine his apperance is a bit too scary) in Christmas Carol. Can’t help to give a ‘hai? ‘ when notice it is Frankenstein. It will be much much better if it’s Scrooge, sharing his love and getting response from everyone, so warm. Superb commercial for all the reasons mentioned above: offbeat, original, basically anachronistic, and empathetic to those who feel “left out” of the holiday spirit. Kudos to the creators of the commercial. Likely to win an award. IT IS BRAD GARRETT !! And Frankenstein is the monster created by Dr. Frankenstein !! Is Frankenstein played by Jeff Bridges in the Apple Christmas carol commercial? I Love Jeff Bridges!! Great actor. Sorry guys, but in my humble but accurate opinion, this is one of the most wetarded commercials I’ve ever seen. What does freakin’ Frankenstein have anything to do with Christmas…I admit that I could be missing the entire point…after all, I don’t claim to be the sharpest knife in the drawer…but this mixing of the holidays has got to stop. What’s next? “Human sacrifice? Dogs and cats living together? Mass hysteria!” I say. Thank you allowing the rant..I will now crawl back in my hole to eat pizza rolls and Pop-Tarts in ignorant bliss. It is Brad Garrett doing the Apple commercial. I looked it up to verify. The monsters name is Adam. The one in the portrait? I thought it might be the little girl who wasn’t afraid of him in the story, the only one to accept him despite his fierce appearance. Correction. No Man is absolutely correct. It’s Mary Shelley. Exa, you worry too much about a Trump presidency. He would never target legal immigrants because his wife and father are legal immigrants. He would never target Muslims unless he thinks the individual is an America-hating radical. Nor is he antisimetic; he is pro-Israel. On a side note, Obama is a lyin’ African. Half of his autobiography is a lie. His campaign stressed that he has never been a Muslim in his life, but his autobiography says otherwise. His Muslim childhood friends in Indonesia said he prayed with them. He is an egomaniac (just like Trump). Obama likes to make everything about race. There are plenty of problems with Obama and Trump, but Trump is not as bad as you think. First of all, I recognized Brad Garrett immediately, and he’s excellent. I thought that the commercial was visually beautiful, but that the poor monster came across as rather pathetic. Screwing Christmas (or holiday?) lights into his neck to gain acceptance. Also, did the song have to be generic and politically correct? I’m an atheist but I think that ‘Silent Night’ for example, would have been more touching.